Do you ever make a decision to try something knowing full well that you are probably making a mistake but you just can’t help yourself, so you do it anyway? You’re so excited to see the end result that you press on full steam ahead even though you know deep down inside that you shouldn’t? Yeah. I do that sometimes too and this is a story about one of those times. 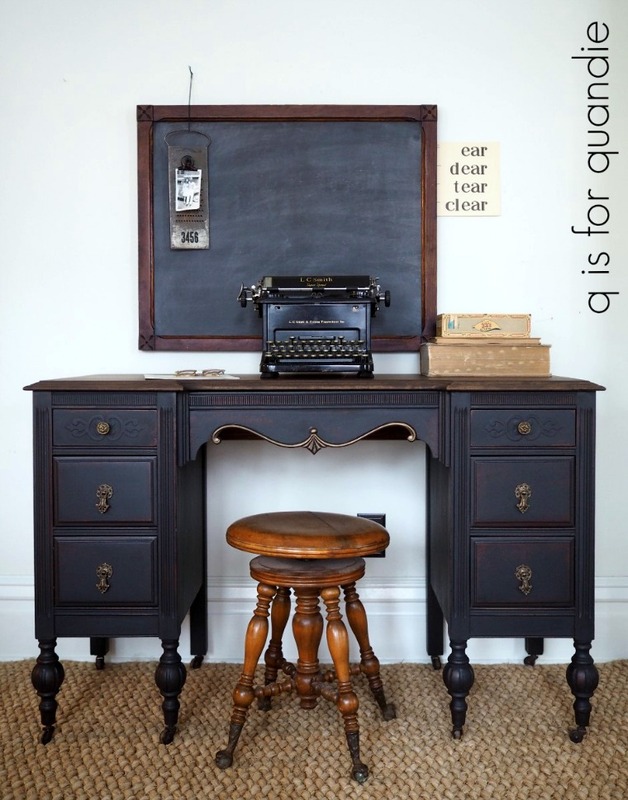 You might have noticed the awesome antique piano stool in the photo of the desk that I shared a while back. I purchased the stool last summer at a garage sale just down the street from my sister’s new house. 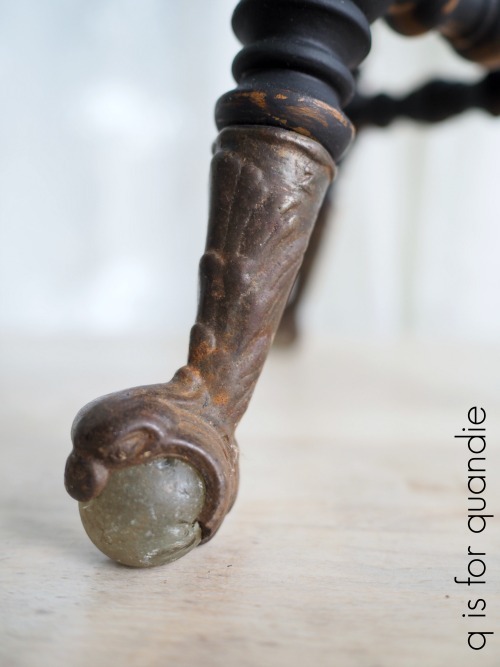 I love the gorgeous ball and claw feet, don’t you? Although gosh, I guess they aren’t really ball and ‘claw’ because those are actually bird beaks holding those balls, not claws. Ball and beak feet? Doesn’t sound quite right, does it? Anyway, I wasn’t quite sure exactly where I’d end up with a makeover on this stool. I thought about painting the entire thing. Or stripping and staining just the seat and painting the base. 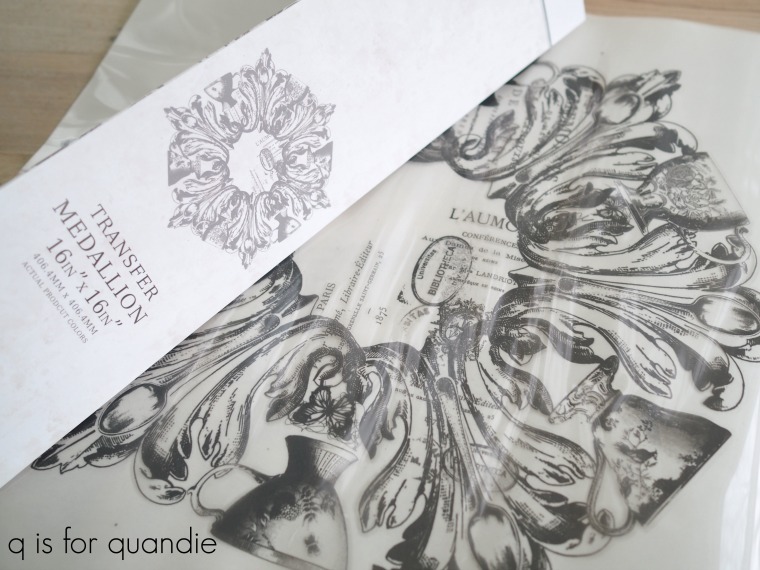 However, when Prima Marketing sent me some samples of their Decor Transfers they included this gorgeous medallion transfer. And it just happened to fit absolutely perfectly on the seat of this stool. It’s as though it was meant to be. 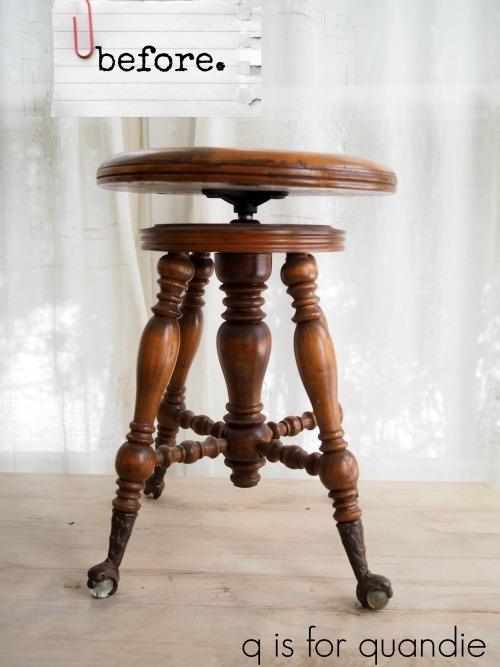 I pictured it over a rustic wood seat, with the base of the stool painted black. So I started by stripping the seat of the stool using Citristrip. Then I sanded it down and realized it had some unattractive splotches and stains. I didn’t want to go too dark on the finish because I wanted the transfer to contrast well with the color of the wood, but at the same time I wanted to blend those stains a bit. So I thought that using Fusion furniture wax in Espresso would be perfect. 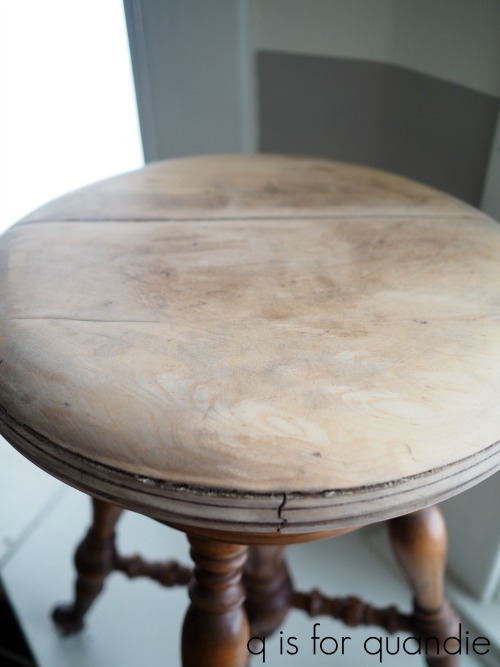 I waxed the seat of the stool which did work perfectly to blend the stains and make them less obvious. But then this is where I made my fatal error. I chose to immediately attempt to apply the transfer over the fresh wax. 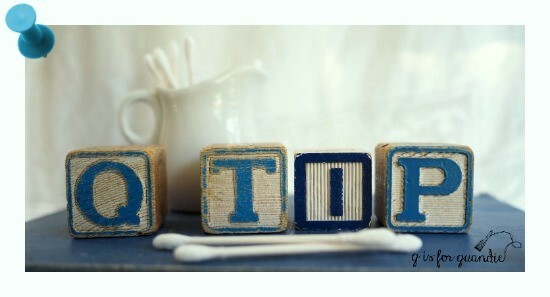 Today’s q tip: Do not apply transfers over freshly waxed pieces. You will end up with a sticky gooey mess. The more you rub the back of the transfer sheet (creating heat with friction and thus softening up the wax even more), the gooier your mess. Normally you would wax after your add your transfer. I knew this. I’m still not quite sure why I did it this way. But I was so excited to see the end result, so I just kept going even though there was a little voice inside my head that kept saying ‘um, I don’t think this is a good idea, stop now before you ruin a perfectly good transfer‘. Yeah. Ruin it I did. The transfer just wouldn’t stick to the fresh wax. The more I rubbed to try and make it adhere, the worse it got. But even though this particular effort was a failure, I could see that the transfer itself was going to look amazing on the wood seat (once I got it right) and fortunately the people at Prima Marketing took pity on me and agreed to send me another of the Medallion transfers. Thus it was time to start over! First I had to remove the portions of the ruined transfer that did stick. If you’ll remember back, I had to remove a transfer once before. That time I had used one over a dark green color and it was also a fail (aren’t you glad you have me to make these mistakes for you, so you don’t have to waste a transfer on them yourself). I tried using a razor blade to scrape it off, but that didn’t work at all. Once these things are adhered, they are on there pretty good (which is a good thing usually, right?). I ended up sanding that one smooth and then painting over it. But in this case I didn’t want to paint over it. I wanted to remove it entirely. So I tried scrubbing with mineral spirits and a scrubbing pad. After lots of elbow grease, I had made some progress but at that rate it was going to take me all afternoon to remove the entire thing. The mineral spirits did remove the wax though which was a good thing. I finally decided to just break out my orbital sander and sand the heck out of it. That did the trick. If you’ve ever wondered how well the Prima Marketing transfers will adhere to your finished piece, wonder no more. They are stuck pretty good. It takes 120 grit sandpaper and an orbital sander to get them off. At this point the original patina of the stool’s seat was pretty much obliterated, so I stained it with Varathane Wood Stain in Early American. Then I tried again with the transfer. This time it went on beautifully and quite easily. 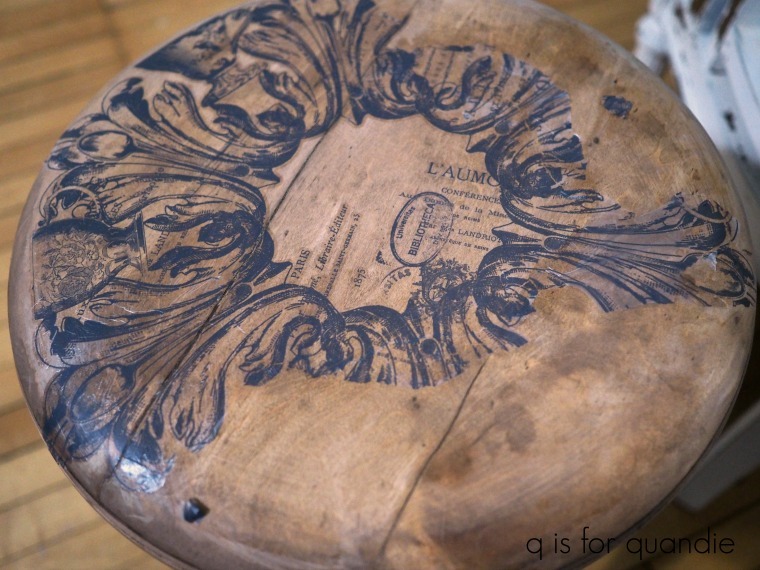 It took no more than 10 or 15 minutes to get the entire design transferred onto the stool. Once that was done, I sanded lightly over the entire thing with 320 grit sandpaper and then added a Fusion’s clear furniture wax over the transfer and the rest of seat. Ahhh, so much better. And by the way, the base of the stool is painted in Dixie Belle’s Caviar. I’m not sure if I’ll keep the stool or not. I love the way it turned out, but it feels kind of small in front of my baby grand. I usually have a chair in that spot. Also, here’s a head up, Dixie Belle sent me all of the supplies needed to paint my piano black. I’ve wanted to do so for several years now and just haven’t had the courage to tackle it. It’s big and it has a lot of flip sides and insides and outsides. But I’m working up the nerve. But in the meantime, I love how the stool turned out, what do you think? If you want to copy this idea on a stool or chair of your own, you can order the transfer via Amazon (here is a handy link). And remember today’s q tip, don’t try to apply a Prima Marketing transfer over freshly applied wax! Transfer first, wax second. Previous putting your eggs all in one basket. If you order the transfer (there is a link in my post to order from Amazon), I’ll help you with yours Paris! I painted a rectangular piano bench over the weekend and love it so much. I painted it with Rustoleum Serenity Blue, with a wash of white over top, and sanded down to the wood in places. It is so gorgeous. Can you imagine an entire piano painted like that?? It would be stunning in a room! So when you mentioned painting your entire piano…well, I can certainly imagine it!!! Oh, lordie. I know we can’t say it so I won’t say, “Please don’t paint that beautiful piano.” I’ll just think it. In a world with a million other things to paint…… Just a thought. Wood is actually quite beautiful. 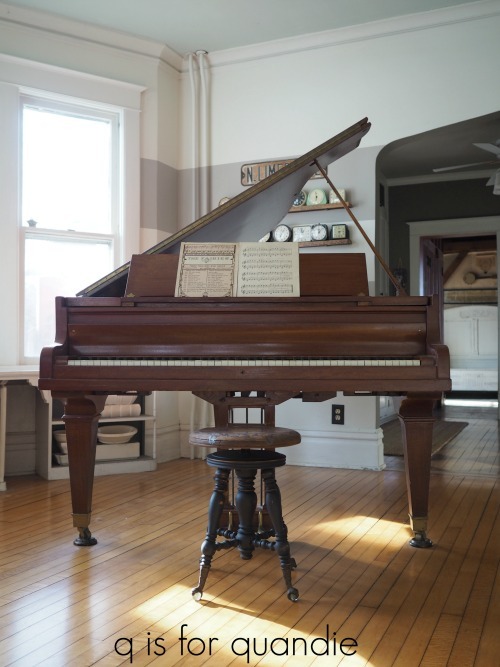 The piano looks good from a distance, but if you were to actually be in the same room with it you’d quickly realize that the finish is in terrible condition. It needs to be either stripped and refinished (which I’m definitely not going to do) or painted. The stool is awesome. And we make mistakes to learn. The. Hard. Way. But your lessons are our lessons. Thanks! Love the stool. As far as painting the piano, I think it would be beautiful. 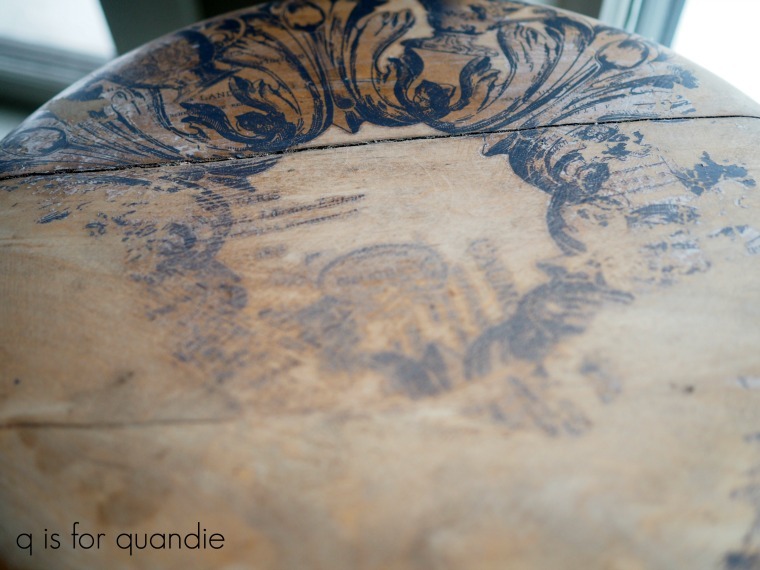 Amy Chalmers @amymaisondecor posted on her Instagram yesterday how she was using iron orchard stamps to stamp a Toile design on her already painted soft white piano. It looks gorgeous! Such creative ladies out there. Your welcome. I just went on her her instagram to look at her piano again and she posted a new photo two hours ago. She painted a landscape scene on the underside side of the piano lid so when the lid is up, you see the painting. It’s gorgeous as well. Wow! Beautiful. Not sure a landscape painting is something I could pull off, but I love it. 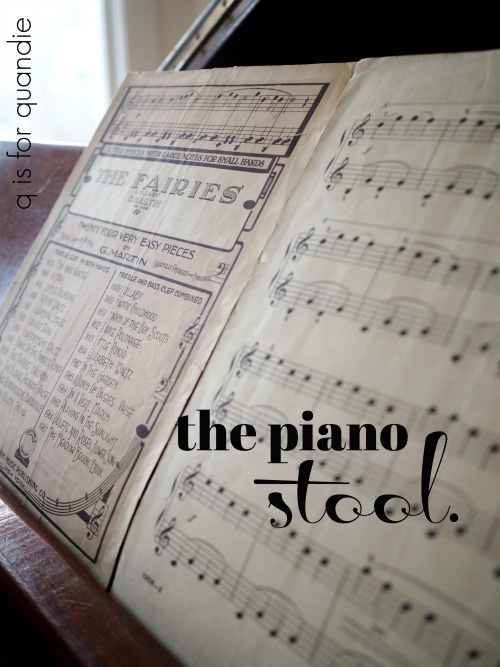 Maybe you can refinish the top of the piano and paint the rest (like the stool). It looks so cool when you do that to dressers. Hmmm, I’ll have to give that some thought. Yes I am glad that you make all of these mistakes first! 😂 I love the piano stool. It turned out awesome. Love the transfer. Yes you should paint the piano. My son has painted a couple of them and they turned out lovely. It is a lot of work. Huge undertaking, but worth it. If I didn’t part with it, I’d be a hoarder. And my house just isn’t big enough to hang onto a bunch of extra furniture. But I’m always happy to think about my pieces living on in someone else’s fab home. Love your tenacity as much as your creativity. 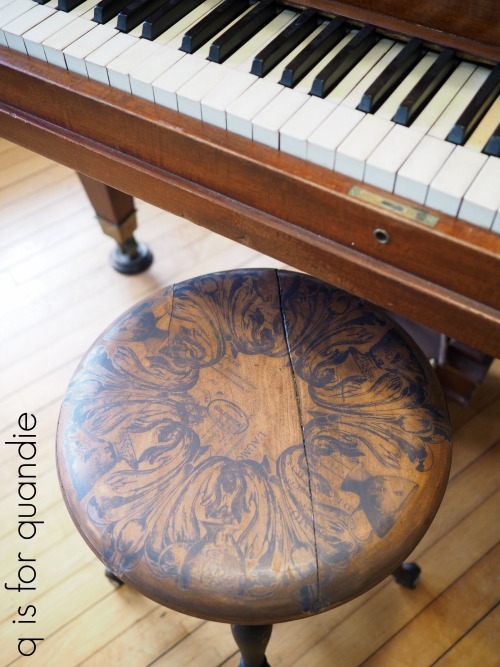 As Yoda would concur “amazing you are.” Transfer on piano stool a total charmer. Ha, Mr. Q will love your comment. He’s a Yoda fan. Your stool turned out great. There is joy in sticking with a project when things go haywire. I have to agree that it looks a bit small for baby grand. I would be on the lookout for a terrific piano bench. That might be all it takes to get you started on the piano. How about painting parts of the piano and leaving about 2/3 of it the original wood. As much as you like stencils and transfers, why not find something glorious for the lid. I’m thinking even an interesting border around the lid might just do it. Or if you found something with an organic shape that compliments the shape of the lid you could do something centered. You’ve given me lots to think about Tricia! Took another look at the piano and wanted to add another comment. I think I would leave the fall (cover for keys) in the natural state and stencil a quote on the underside so that it is visible when the fall is open and the keys are exposed. Love that idea! That is totally brilliant! Can’t you just paint the outside like you would do with a cabinet that you want to leave wood inside? Maybe try it and if it doesn’t work out you could then paint the inside later. My husband was the paint shop superintendent at a submarine base and knows paints and solvents etc. He also plays piano, several guitars, violin, etc. He’s “Into” instruments so to speak. 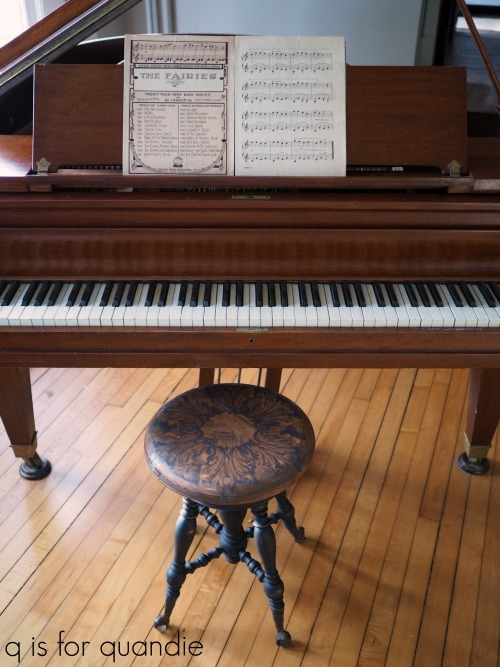 He shutters when people start talking about painting pianos because he says some paints and solvents can collapse the wood cells and ruin the sound. He begs people to consult an expert IF the piano is still good and is played. Of course, if it’s just one that has been uncared for and not good sounding to begin with, it will make no difference. Sadly this piano falls into that second category. It is pretty much falling apart. It hasn’t been tuned or played for probably at least 15 years or more. The ivory veneer on the keys is coming unglued and falling off right and left. I know it sounds nutty, but this has been the handiest piece of furniture for me. I use it for folding laundry, or as a bar or buffet during parties. But mainly I use it as a workbench for painting and other craft projects (covered with a drop cloth of course). When I’m not using it for those things, it looks pretty in the room. But it never serves its purpose as a piano. I’ve never figured out another piece of furniture that I could use in the same way in that space (if you look on my ‘tour my house’ page you can see a photo of where it sits in my house). It’s really just decorative.